Stacker trucks are primarily used for stacking pallets at a range of heights, but they're very versatile machines, and perfect for moving pallets around a warehouse. Our stackers come in pedestrian, stand-on, stand-in and sit-on models, and have been designed with ergonomics and usability as the focus. Double stackers, which can carry two pallets at once, and stackers with telescopic forks for deeper racking are also available. Order pickers are flexible and manoeuvrable, and are used to assist and lift up their drivers for easier picking at low, medium and high levels. When not used for picking, these trucks can also be used for the transport or stacking of pallets. 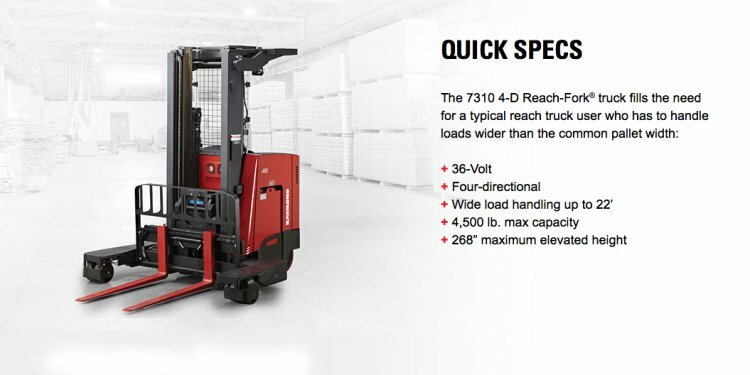 When your materials handling needs are particularly intensive, a quality reach truck may be the best tool for the job. These trucks' reach masts allow them to remove and place pallets from high racks with ease, and their solid design and sheer strength makes them perfect for heavy loads. Other features, like the telescopic forks and multi-directional handling available with some models, lets them handle deep racks, narrow aisles and irregular pallets with ease. In some warehouses, aisles may be so narrow that a conventional forklift cannot turn around to leave the aisle after retrieving a pallet. In this case, you might need a narrow aisle truck, which has a slim profile and can use rotating forks to manoeuvre pallets in very small spaces. Our VNA truck, the TERGO URS, is perfect for this situation, and was the winner of the International Forklift of the Year award in 2015, in the warehouse truck category. Diesel and LPG counterbalance trucks use an internal combustion (IC) engine to power themselves, rather than a battery. Their weight is concentrated in the rear, meaning they can lift heavy pallets to tall heights without tipping over. Refueling is a quick process, making them perfect for intensive outdoor tasks - and with our rugged and durable trucks, you won't need to worry about reliability.